Gettysburg Civilians: Evil Beasts or Compassionate Heroes? Gettysburg civilians faced heavy criticism in newspaper accounts and in some of the journals and papers of military men and medical personnel. Harsh details of residents charging for bandages, food, and transportation abound. G.A. Coco – a historian of Gettysburg’s aftermath – recorded seventy-five complaints in the personal writing of individuals at Gettysburg. At the time and in the following decades, the residents of the town of Gettysburg were able to redeem their reputation, but a slur has remained against the names of the civilians in the countryside. Perhaps they do not receive open criticism now, but the unknowing acceptance of a prejudiced views and stereotypes from a past era has limited the available information about these people. First, there was a political difference between the majority of Gettysburg town residents and those living in the countryside. Many of the town citizens had Republican views while the farmers leaned Democratic. During the war years, Democrats were viewed with suspicion; were they Copperheads, opposing the war effort? 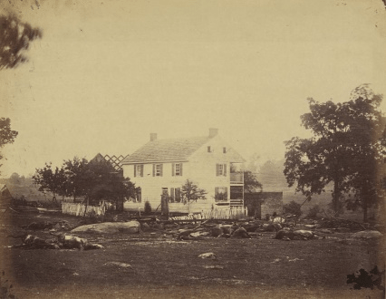 The Trostle Farm after the battle. Gettysburg farmers faced harsh criticism after the battle. Secondly, compounding the political problem was social prejudice. Many of the farmers were German-American, usually first or second generation immigrations. There was much ethnic tension in mid-nineteenth century America, and the German immigrants were often treated poorly. [ii] There is not much evidence of open prejudice in the actual Gettysburg community, but the German accents, appearance, and mannerisms of the country residents were noted, scorned, and mocked by outside reporters and medical personnel. Thirdly, patriotism produced a harsh view on anyone not in uniform. Significantly, farmers (the men) received much of the criticism. Consider the feelings of the Union officers, soldiers, and surgeons, though. They had been fighting and dying for their country. They finish burying their dead comrades and head to the field hospital to check on a wounded friend; then they meet a German farmer bemoaning the loss of the his crops and wondering when he will get paid back for the damages while his wife is wailing about her torn linens. The circumstances of these encounters alone, combined with the social prejudice, probably prompted the bitter tone and complaints against these civilians. So acknowledge the civilians who really did disgrace themselves, but stop viewing all the Gettysburg farmers in this way. Is it fair to let the views or actions of the minority influence how we view an entire group of people? Some Civil War soldiers were undoubtedly thieves, bounty-hunters, and scoundrels, but has this minority influenced the way historians think of all soldiers? Perhaps it could be argued that the minority of Southern gentlemen who owned slaves have been used as the stereotypical example of the Confederate soldier…and the effects have not been good. Thus, while understanding the factors influencing the reporters’ views and accepting the truth that there were some very selfish civilians, it is time view these families of the Gettysburg countryside as individuals…and stop labeling or ignoring them because of the actions of a few. Digging into the primary sources regarding the farmers and families of the Gettysburg battlefield reveals a new perspective on their courage and sacrifice. Unlike the town residents who might have had the option to volunteer to bring wounded soldiers into their homes, the country families had no choice. Medical staff took any and every standing structure and turned it into a field hospital, whether the owners approved or not. Civilians in the direct area of the battle (for example, the Sherfy Family who owned the Peach Orchard) fled from their homes. When they returned their crops and gardens were ruined, their livestock was dead, roaming the countryside, or butchered for rations, and their homes and barns were blood-splattered field hospitals. Some civilians, not in direct battle lines, decided to stay on their property and thus became “staff” in the medical facility in their home. 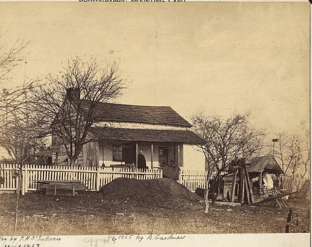 One of the best and most moving accounts comes from a civilian writer on the John Cunningham Farm (near Marsh Creek, south of the Fairfield Road). 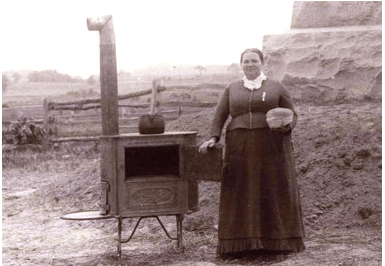 The house and barn had been taken over as a field hospital shelter, and the women had turned many barrels of flour into bread while Father interacted with and aided the injured soldiers. Thus, the physical needs of the wounded were met, but so was the need for comfort as the daughter records: “Mother was unable to keep the children away from the homesick soldiers. They would carve them toys…and play with them endlessly. The children would trot to the well with canteens strung around their necks, carrying cold water to the men. When Mother would go to the barn…she would sometimes find a soldier asleep on the hay with a sleeping child on each arm.”[v] An entire family – children included – was working to assist, save, and encourage the wounded men. Josephine Miller, Mr. and Mrs. Picking, and the family at the Cunningham farm hardly fit the “evil beast” image of miserly, unpatriotic, selfish farmers. It is time to identify and acknowledge the prejudices which have clouded the perspective about these people. Though there were certainly instances of selfishness, there were also many courageous and sacrificial actions which should be honored and remembered. Since the country civilians were too busy assisting or were not given the opportunity to tell their story of Gettysburg, it is time to look back and find their courage, faith, and nobility of character. [ii] M.S. Creighton, The Colors of Courage: Gettysburg’s Forgotten History: Immigrants, Women, and African Americans in the Civil War’s Defining Battle, (2005). [iv] Henry Kyd Douglas, I Rode With Stonewall (1940), 253. [v] Gregory A. Coco, A Vast Sea of Misery: A History and Guide to the Union and Confederate Field Hospitals at Gettysburg, (1988), 152. This entry was posted in Battlefields & Historic Places, Battles, Campaigns, Civilian, Memory and tagged Battle of Gettysburg, Copperhead's, Henry Douglas, Henry Slocum, Joseph Carr, Josephine Miller, Leister House, peach orchard, Sherfy Farm, Trostle Farm. Bookmark the permalink. 1 Response to Gettysburg Civilians: Evil Beasts or Compassionate Heroes?